Before I took this year's Travels I went to a seminar at REI on hiking the Appalachian Trail. Although I didn't hike the trail I wanted to know their packing list. If they could live out of a backpack, living out of my Prius should be easy with a lot of room. Ok. I want to have more than one tee shirt and 2 underwear but my thought was I would like to have a reference point for what minimal things I should bring for my second year of Prius Travels. I didn't learn any magic tricks that I hadent already figured out the year before. What I did learn was that if it isn't absolutely necessary leave it home. My only problem is that I had to bring clothes for winter, spring and summer weather. Backpackers don't do this. A winter coat takes up too much space! Although I absolutely needed it getting through Texas, campfire sitting at night, and my Park City family gathering. The rest of the time it was in the way. When I head out on my travels I have very little room in my Prius for anything extra. When I'm asked to carry something for someone I kind of cringe thinking of where I will put it. On the other hand, I did bring things I didn't need and would not bring again. I will cover the things that I carried that I may not bring again in other blog posts. To free up some space in my Prius I did send a couple boxes home with things that I no longer needed. The key to living in a very small space like a Prius is being organized. My Small car friends all talk about the importance of being organized. My way of traveling in my Prius is everything has a place and it has to have has a purpose. If I have something that no longer has a purpose then it gets given away or sent home. I buy very few things on my travels as I have no room. The things I buy must bring me some kind of happiness, or hsppiness to someone else, if a gift. My photo above is one thing I bought on my travels at the Mesa, AZ flea market. 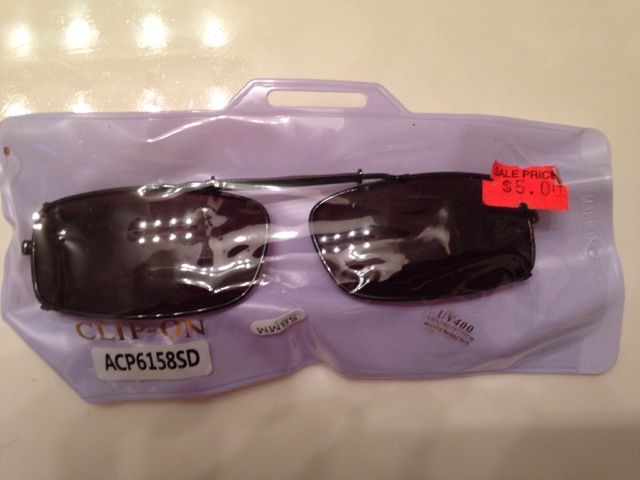 One pair of my sunglasses broke so I decided to get these clip-on's for $5.00 so I can read in the sun. Like the mini camping shovel I bought at the Havasu City Swap Meet, they improved my life on the road. If you are looking to travel living out of your car, bring only what you need. It must bring you happiness in some way. If it doesn't it will consume living space and the reduced space doesn't make your travels easier.